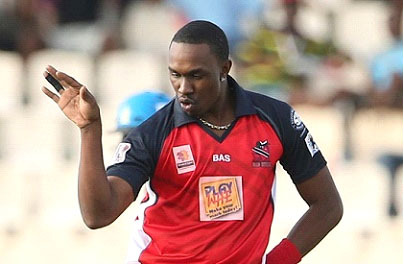 PORT OF SPAIN, Trinidad, CMC – Experienced Twenty20 campaigner, Dwayne Bravo, has hailed the move by Caribbean Premier League organisers, to stage games in the United States. Trinbago Knight Riders captain Dwayne Bravo. For the first time this season, CPL matches will be played outside of the Caribbean, with six carded for Lauderhill Stadium in Fort Lauderdale, Florida. Bravo, who will lead Trinbago Knight Riders in their title defence this season, said the move was one which would help expand the sport’s appeal. “It’s been a while now that a lot of people have tried to get cricket associated with America,” said the 32-year-old Bravo. “It’s good that CPL take that responsibility and take it over there. Let’s see, hopefully we get good facilities and good conditions. It’s all well and good to say ‘oh, cricket is in America’, but we need to have good facilities and the cricket needs to be good. Guyana Amazon Warriors and Barbados Tridents will open the schedule of matches there on July 28, in a repeat of the dramatic 2014 final in St Kitts. Bravo’s side, Trinbago Knight Riders, will play in the second game a day later when they clash with St Kitts and Nevis Patriots. Double-headers are scheduled to be played on July 30-31, in weekend fixtures expected to attract the large Caribbean population resident in Florida. But despite the lure of playing games in the United States, Bravo says Knight Riders were looking forward to playing in front of their home crowd at Queen’s Park Oval. “This year the first round is being played in our backyard and it’s very important that the fans will come out and support us,” said Bravo. “We have a branding change, in terms of name, but at the same time we still represent Trinidad & Tobago. The Trinbago Knight Riders is a very good name and I think everyone is looking forward to it. Knight Riders – then called Trinidad and Tobago Red Steel – beat Tridents in last year’s final to win their first-ever title. They will raise the curtain on this year’s campaign with a clash against St Lucia Zouks. This year’s CPL season runs from July 29 to August 7.